22 pairs of Kemba's "Homecoming" colorway Micro G Juke go live on ua.com tomorrow, December 10. In an alternate, parallel dimension, the Charlotte Bobcats are scheduled to play the New York Knicks at The Garden tomorrow night. Kemba Walker is an emerging Rookie of the Year candidate, and is getting ready to make his triumphant return to his hometown for a showdown with the Knicks new point guard, Chris Paul. Unfortunately, in our present reality, the schedule is now 66 games long, and most players will be running half-speed walk-throughs at practice facilities. Where is Walter Bishop when we need him? All is not lost, however. Under Armour produced a special White/Silver/Orange colorway of the Micro G Juke in anticipation of the originally scheduled game, celebrating Kemba's New York homecoming. While the game is no longer happening, Kemba and UA are going to put 22 pairs of the "Homecoming" Micro G Juke on UA.com tomorrow night, December 10, at 7:30 PM. 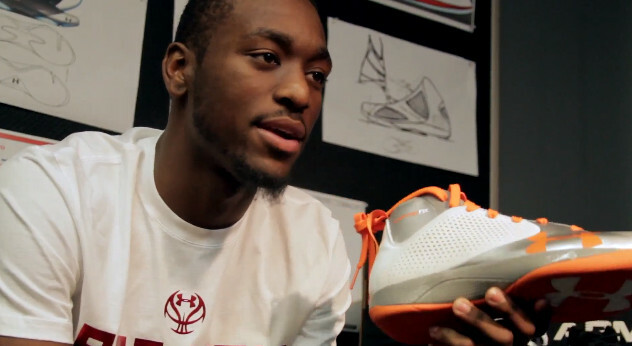 Included with each pair is a copy of Kicks personally signed by Kemba.